Just a quick post to get up to date. Went up Saturday in IJD for my mandatory crosswind circuits lesson as weather was finally suitable. Wind from south min 10 max 25 knots, gusting, which was pretty much ideal crosswind conditions with crosswind maximum of 17 knots. That said, during the lesson the crosswind I actually experienced was not above 10 or 12 knots, but it did quality as crosswind, fortunately. I made a reasonable fist of the hour, crabbing into the wind on my approaches and trying to dip my right wing into the wind on landing. I would very much like to have more crosswind exposure to the same conditions before experiencing any heavier crosswind, however! Following my highly successful and gratifying 4th solo this morning, the wind really got up and we decided to head out for an hour of dual circuits in the hope of knocking off my mandatory hour of crosswind circuits instruction. Unfortunately, the wind – while really starting to blow a gale with gusts of up to 20 knots, first from my left on takeoff and then from my right as the lesson progressed – didn’t have enough of a serious crosswind component to qualify. So that lesson remains to be done. However, John did tell me I could log this hour as “circuits in strong, gusty 20 knot winds, with circuit emergencies”. Not too much to write. Needless to say it was by far the windiest and most challenging conditions in which I’ve flown so far. The wind played hell with all legs of my circuit, blowing me every which way, and introducing me to the subtle joys of learning to “lay off your drift” by angling the aircraft into the wind so as to fly straight circuit legs. By and large I failed miserably at doing that today. I spent an hour getting thoroughly bounced around and wrung out, making a series of successful but not pretty landings. John – I swear there’s a malicious streak in him somewhere – decided to make 2 of these simulated engine failures. So, 2 circuits in a row, we cut engine power on our monstrously fast downwind legs and made glide approaches to the runway. Both times I came in too high and, fighting an almost 20 knot headwind to get down to the runway, had much difficulty in doing so. John showed me how to sideslip down to the runway – basically a controlled technique involving opposite rudder and aileron to rapidly lose height without gaining airspeed. My heart jumped into my mouth both times, we lost so much height so quickly that the runway seemed like it was just rushing vertically up at me through the cockpit window. At what seemed like the last moment, John brought the plane out of sideslip perhaps 25 feet off the runway and handed her over to me to land, which I did (though not prettily). I think I’ll need a lot more practise to do the sideslip manoeuvre that close to the ground without needing a change of pants. (John’s a glider pilot also – it really shows in the confidence with which he sideslipped SFK today). Less said the better about the landings, but both we and aircraft got back in one piece, so in one sense, mission accomplished. Well, no wasting time. Today dawned clear and nearly cloudless, and my usual instructor John wasted no time in getting me out for my 2nd and 3rd circuit solos. I was a tad rushed and bothered when I got out to Bankstown this morning. Had a difficult early morning with the baby – she’s taken to waking up in the middle of the night now and again, and at 4am this morning she managed to climb out of her cot with a big thump onto the wooden bedroom floor. She wasn’t harmed, and we got her back to sleep, but I and particularly Laura were pretty tired and I didn’t feel totally rested. I was conscious of this when I arrived at the club, took a few breaths and just got on with it, but the upshot was that I ended up pre-flighting and taking out an aircraft I hadn’t actually booked! (I’d booked UFY, but I took out NFR). Fortunately my error and lateness in getting out to the circuit resulted in us being no more than 15 minutes late back to the club, but someone else was waiting for the aircraft after me, and it wasn’t great form to bring it in late when I hadn’t even booked it. John and I did 3 or 4 circuits – one in particular being a “very good circuit overall” according to John, so I dropped him at the run-up bay on 29 left and headed back for my 2 circuits. Being in NFR this morning and things still being fairly cool, the plane climbed like a bat out of hell! 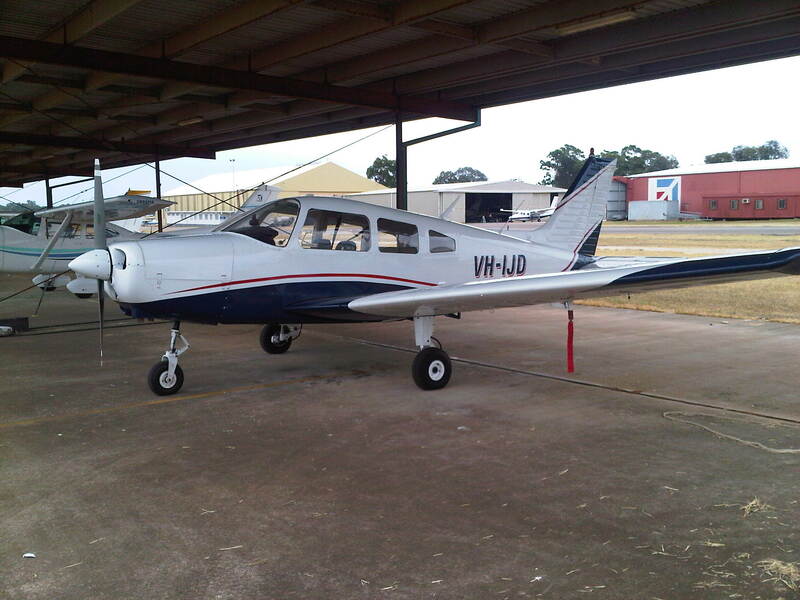 (Unlike UFY in my first solo yesterday – it was hotter yesterday and UFY is an older aircraft). Not much to say about the circuits that I didn’t describe in detail yesterday. It was wonderfully clear and smooth, nil turbulence. Only issue was a sharp surprise when I was about to turn downwind on my 1st circuit when I noticed a Cessna 152 on my left at about my height and turning downwind himself! Turned out he’d been behind me while I was taking off and he’d done a go-around – that is, he didn’t land but headed back up into the circuit for another go. Tower didn’t see fit to tell me about this until after I’d seen the Cessna myself. Fortunately however I did see him. I didn’t need to take any really drastic evasive action, but it still affected my circuit. I slowed down much earlier than I otherwise would have done just to make sure I didn’t run up the back of him. 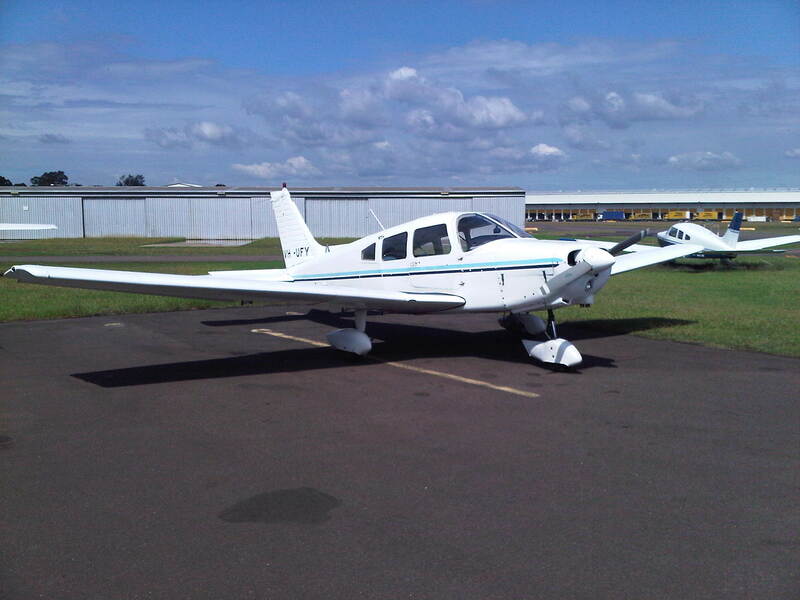 (My Piper Warrior cruises at about 10 KIAS more than the Cessna 152). I also extended my downwind leg considerably to give him space to land before I did. This was another good early lesson in the importance of maintaining a vigilant watch outside your aircraft. Even in controlled airspace, the tower won’t always tell you about conflicting traffic. Rely on your own “see and avoid” vigilance first and foremost. Making a decent landing roll – avoiding a repeat of my unfortunate landing after yesterday’s Advanced Stalls lesson – I taxied back to pick up John, who took a few happy snaps of me for the “first solo” page on the club website and newsletter. As things turned out, I went out again in NFR for my 3rd solo. In yesterday’s stalls lesson I’d discovered that the stall warning horn was not working (even though I’d tested it before takeoff), and had made sure Ashley had made an entry on UFY’s maintenance release. Consequently, UFY was in maintenance today and unavailable, but NFR became available for my 2nd session today, so it worked out well. On late final approach for landing after my first circuit I was 99% sure I hadn’t received my landing clearance from tower – there was plenty of radio traffic, perhaps they forgot. I did have the option of checking with them before landing, but I opted to do a go-around – my first solo one, and reasonably well executed I think. Either the 2nd or 3rd touch-and-go was bloody ordinary. Hit the runway OK, but not well lined up with the centre line, so my takeoff roll had me heading for the left hand side of the runway and I had extreme difficulty re-centreing the aircraft. Fortunately I reached 55 KIAS before over the edge so I just lifted the nose and got up. Not the best takeoff I’d ever done. Conditions for this solo were significantly more difficult – a rising crosswind and a fair bit of turbulence so I was bounced around a wee bit. Handled it OK. Made it extra important to focus on my airspeed on base and final legs though, the wind was gusting enough that sometimes my airspeed – which I’m trying to keep at 70 KIAS – would increase up to nearly 80 or down to nearly 60. Proved to myself that my throttle use on landing is getting much better though. Touching down for my full stop landing, I was glad to get down. The wind was getting up and my work rate in the circuits had been pretty high. But it was a good landing roll, and John grabbed another photo or two and then showed me video of my landing that he’d taken on his iPhone. (I believe he’s emailing it to me, will get it on YouTube when available). It looks good from a distance, anyway. Weather permitting, tomorrow’s first session is my first completely solo circuit session. I’ll have the aircraft entirely to myself, from startup at the club to taxiing, takeoffs, circuits and landings, to shutdown back at the club, including all radio calls. Can’t wait! John got some video of my final approach and landing during my 3rd solo yesterday afternoon at Bankstown. It’s taken from his iPhone, so there’s no zoom and it’s a bit shaky, but should you care, at about 29 seconds in to the 1-minute footage, you can see me in NFR make my final approach and landing. Day 14: lesson 17 and First Solo! My first solo finally happened today! It absolutely poured rain this weekend, and to cap it all off, I contracted a stomach bug on Sunday which put me out of action. I pulled the pin on my 2 planned lessons yesterday, as I was still feeling crook and the weather yesterday anyway still being pretty dodgy. (The south coast of NSW has got an absolute drenching and floods in the last few days – it’s clearly been a pretty big trough system). So when I woke up this morning I was very mindful of being “behind” by 2 more lessons. OK, you can’t do anything about the weather. But it was still a lost day. This morning didn’t look great either, early on there was fog down to 500 feet which would definitely have kiboshed any flying. However the TAF (Terminal Air Forecast) for Bankstown for today forecast some clearing, and I figured that you need to be out at the aerodrome to capitalise on breaks in the weather. (And after all, forecasts are only forecasts). So after dropping the kids off I hared out to Schofields noting some clearing cloud along the way. Getting here about 0915 and meeting the Grade 1 instructor with whom I’d been slated to fly today, we checked the ATIS and called the tower, as conditions were still marginal but appeared to be clearing. Tower said that we should be right to fly in about half an hour. My instructor (Ashley) reckoned we’d be right to get the pre-solo checkride done, so I preflighted the aeroplane, which today is UFY (Uniform Foxtrot Yankee), possibly the club’s oldest Piper Warrior. I ran through the pre-flight checks, primed the engine and attempted to start it, but repeated attempts were to no avail. Not wanting to flood the engine or do something stupid, I advised Ashley, who jumped in the aircraft with me and advised me to pump the throttle twice. Which I did, and then I got a start! So a small trick picked up there that may come in handy. Taxi over to the apron in front of the hangar next to Schoies, shut down the engine, then follow Ashley’s directions on left and right rudder as he turns the aircraft around to a suitable position for fuelling. With clearance to start up, we taxied out to 29 left and on the way Ashley talked me through the plan. He hadn’t flown with any of my usual instructor’s (John) students before so his preference was to sit back, let me do a couple of circuits and only speak or intervene if I was doing anything that was unsafe or dangerous. He was at pains to emphasise that this wasn’t to make me nervous – which I appreciated. So, taxi via Kilo, Lima and November to run-up bay for 29L, then into the bay for our run-up checks. Run-up and pre-takeoff checks complete, I ran through my now-learned safety briefing – which Ashley seemed content with. Then clearance to taxi to the holding point S4 short of the runway, switch to tower frequency and make the call. “Bankstown Tower, Warrior Uniform Foxtrot Yankee, ready for circuits on two nine left”. After a brief hold, we were given takeoff clearance and off we went. Running through the circuit routine, everything went pretty smoothly. I was a little more apprehensive than usual, due to new instructor I guess. After two circuits, landings for both of which were quite good, Ashley commented as such and joked, “Wait till you see what I’ve got in store for you!” Nothing, he added, that I shouldn’t already be ready for, but it was a somehow welcome effort to lighten things up. Ashley did add, though, that my approaches had seemed a little low, and asked what I was aiming for. The runway numbers, I replied. Ash’s suggestion was perhaps to aim for a mark or two above the numbers, seeing as I had plenty of runway and to try to make sure my approaches weren’t too shallow. So I tried this on the next few landings, with good results. In an emergency situation necessitating a glide approach to the runway (or other suitable landing area), if you’re confident you’ll make the runway, use your flaps early. It will make your approach and landing slower, easier and safer! After 2 more circuits – one very good, one good except for wobbly landing roll – Ashley judged that I was ready to go. So we came to a full stop on 29L, then taxied back to the run-up bay. Ashley hopped out and asked me to pick him up at that spot after one circuit. He closed the door and walked away. Wow! I was immediately hit by a feeling of space in UFY’s cabin. No instructor sitting beside me, no-one to have to squeeze my arm and hand past to get my right hand down to the trim wheel between the seats. Funnily enough things also seemed really quiet, too. Reaching the holding point, I switch to tower and make my call. “Bankstown Tower, Warrior Uniform Foxtrot Yankee, ready for first solo circuit on two nine right”. Takeoff clearance received, I lined up and opened the throttle. Made my rolling checks as I was under way – engine revs max and stable, T&P’s (temperatures and pressures) good, ASI (Airspeed Indicator) live. Hitting 55 KIAS (knots indicated airspeed), I eased back on the control column and up we go, climbing out much fast than usual with only one passenger on board (me!) at a best-rate-of-climb speed of around 75 or 76 KIAS. 300 feet and I check engine RPM, T&P’s, carby heat cold, fuel pump on, alignment with runway. 400 feet I start clearing my turn (right-centre-left) and picking a reference point 90 degree to my left, then at 500 feet into a 15-degree banked turn to the left, keeping an eye on my airspeed. Looking out my window down at the airfield I’m picking when I’m 45 degrees to the runway, then at about 800 feet I roll into my downwind turn, radioing tower as I do so, “Uniform Foxtrot Yankee, turning downwind, full stop”. Tower advises me to follow traffic (was it a Cessna?) on late downwind, I can’t see it yet so I acknowledge, “Number 2 in circuit, looking for traffic, Uniform Foxtrot Yankee”. Settling down at 1000 feet (fighting off my tendency to gain height in early downwind), I throttle back to 2350 RPMs and start to run through my pre-landing checks, cruising at about 95 KIAS. Brake pressure – good. Undercarriage – fixed to aircraft. Then I sight the plane in front of me so I radio tower, “Traffic sighted Uniform Foxtrot Yankee”. Then the rest of my checks – Mixture, full rich. Fuel Pump – on. Instruments – T&P’s good. Switches (that’s magneto switches) to Both, Hatches and harnesses secure. Level with the threshold of 29L I throttle back to 2000 RPM and put out 2 stages of flaps, quickly bringing UFY back to about 70 KIAS. Checking again for 45 degree alignment with the runway, I put my carby heat on, throttle back to 1500 RPM, lower my nose and turn left onto base. The aircraft ahead of me has just landed. I fly my base leg, making sure my IAS stays at 70, also that I’m losing height as I go, using combinations of pitch and throttle. At 550 feet I turn left onto final, trying to wake my feet up and conscious of my airspeed. 300 feet and I flip the carby heat to off, adding just a little throttle as my airspeed was creeping a touch below 70 KIAS. Then lower the nose and pull the throttle back to nearly closed. Using my feet as I’m getting blown off runway centre line just a little bit, then I’m just over the threshold, throttle back to full idle and eyes on the end of the runway to judge my landing flare. Bringing out down, I didn’t achieve quite the “chirp” sound of the tyres I was looking for, landed just a bit too hard for that, then I’m on the ground and on my landing roll-out. I manage to make this one a good one, braking smoothly and only remembering belatedly to pull back on my control column. Turning left off the runway, I radio ground that I’m taxiing back to the run-up bay to pick up my instructor. As I taxi it hits me that I’ve just flown an aircraft, alone, for the first time in my life! A life-long ambition realised and the excitement hits me. I whoop like an idiot into my microphone, glad that I’ve done it and glad that I had my thumb off my radio switch so no-one else had to put up with hearing me. I enter the run-up bay and pick up Ashley, who grins at me, shakes hands and says “Congratulations!” I then make my last call for the lesson. “Bankstown Ground, Warrior Uniform Foxtrot Yankee in run-up bay for two nine left for Schofields, request taxi clearance”. Ground clears me to taxi back to parking via Lima, and adds a welcome note of congratulations on my first solo, which I acknowledge warmly. A long taxi back to Schofields, a quick shutdown, and I’m done. So. Everyone always raves about the day they did their first solo. I can now proudly join their ranks. Awesome. Between my memory, and this written account, I’m sure it will stay with me for many years. Day 11: Lesson 13 – 8th circuits lesson, and we’re getting there! Yesterday was an enforced day off, which I used to good effect by finishing off my PA28 Endorsement Questionnaire (which I’m about to check against the answers) and doing study for my pre-s0lo theory exam. Had an hour of circuits this morning and I feel like I’m finally starting to turn the corner! I made a “6/10” landing – the highest rating my instructor has given me so far – and am doing much better in holding off the control yoke on the landing flare. More work to do, but I think I have got the “feel” now. At least 2 out of the 6 or so landings made that lovely “chirp” sound of the tires, and on the later landings I succeeded in not banging the nosewheel down onto the runway. I erred towards too much height (above 1000 feet) on some of my downwind legs today, which resulted in having to lose heaps of height on my base and final legs. (Wasn’t awful, but not ideal). On one particular landing this resulted in me arriving way too high over the runway, which in turn resulted in me trying to overcontrol my height off the runway with throttle and letting my airspeed creep too low. That’s not good. Watch the airspeed on late finals! I made one really slow landing on which I was going as low as 50 knots even before I was over the runway threshold. That’s too close to the stall (even though I had full flaps out). Need to maintain about 65 knots over the airport fence and 60 knots over the runway threshold. On another landing, I arrived a bit high, and while my use of control yoke is getting much better in general, on this particular landing I “ballooned” the aircraft into an upwards trajectory when I wanted to be going down towards the runway! Watch the height on final approach. If everything else is set up well and you’ve got 2 stages of flap out but still too high, you can consider using your 3rd stage of flap (if you’re still on early finals). You don’t want to arrive high over the runway threshold – if you do, then you’ll take up precious runway length getting down to flare height before you can land, and you risk buggering up your landing by trying to get the nose down too fast. (A go-around nearly always the best option if this happens). It was really good to experience these two things today, it will only make my future landings better and my watch of height and airspeed more vigilant. A couple of interesting things today, both relating to a particular controller in the tower about whom my instructor was not very complimentary. On the 2nd circuit, on early downwind, John grabbed the controls to take evasive action as he spotted an aircraft on late crosswind climbing towards our level and coming close to us! It was only as John was doing this that we received a call from the tower advising us of this traffic to our left. Bottom line, the pilot in the other aircraft had started his crosswind leg far too early (probably before he reached 500 feet) which resulted in his catching up to us just as we were on early downwind. John demonstrated the classic responsibility of the Pilot In Command to “see and avoid”. However, the tower should have advised us of the traffic much earlier than they did, a fact which John pointed out via the radio. On that same circuit, despite our having made the correct downwind call for a touch-and-go, the tower failed to give us landing clearance when we were on very late final approach, so we initiated a go-around (which I’m happy to say I handled quite well despite retracting initial flap too early). Two lessons were scheduled today, but only 3/4 of one happened due weather. The low cloud and gusty wind conditions forecast didn’t arrive until a bit later than anticipated, but arrive they did and after about 40 minutes and 3 circuits my instructor pulled the pin on the lesson. In fact the crosswind was so strong that he made the final landing himself, judging (quite reasonably) that I was not yet ready for it. I can’t do much about the weather anyway. As mentioned above, I made my best landing so far. John only rated it 5/10, but he did say it was “good”. The approach was stable (this was while the wind was on the rise but hadn’t really come up yet in terms of serious crosswind), use of rudder was reasonable, hold-off was good up to the point when main wheels touched the ground with only a light “chirp” sound, and I actually heard the stall warning sound at that point, which is ideal. However I then dumped the nosewheel on the ground rather than continuing to hold off and allow the aircraft to fully land itself. But it was a key learning step and I can’t wait to improve it next lesson. It was my first experience of serious crosswind. Circuits were on 11 right today, and wind was initially from 150 degrees magnetic (that is, from about 40 degrees to my right) at 10 knots. This threw new variables into the equation. I needed extra right pedal to stay in line with runway on takeoff. And, I had to contend (and struggle) with the crosswind blowing me too close back to the runway on my downwind and final legs in particular. After my “prize” landing, the last circuit I flew fully today was really difficult. The weather was coming in fast and the wind was both changing direction and increasing in terms of speed and gusts. Things were really bouncy and difficult for me on this circuit, and the landing not awful but the approach pretty scratchy. I’ve not yet been properly schooled in “crabbing” the aircraft into the wind on final approach – though I get it in principle, and this will come in my training. On the last circuit John checked the wind with the tower and decided that this was our last circuit and we would land. On late base he further decided that the conditions were too challenging for my present level so he took over and landed. Crosswind was gusting up to about 28 knots at this point – the aircraft is only rated up to 17 – so I had no problems handing over the controls! But it was good early exposure to the joys and challenges of crosswind circuits, takeoffs and landings. I’d like to have got 2 hours of flying in today, but at least I got 45 minutes, and I feel as though the turning point with my landing flare is just around the corner. Stayed in the clubhouse to (almost) complete my endorsement questionnaire for flying the PA28 Warrior, which is a necessary step before first solo. Tomorrow is no-fly Tuesday – forecast weather would probably ground me in any case – so I’ll bone up for the pre-solo exam and hopefully get that out of the way on Wednesday. Weather doubtful for rest of week though. Hope I can scam at least a couple more hours of circuits in the air this week at the very least. Otherwise, fear – as a very possible outcome – that Friday’s scheduled pre-solo checkride (and possible solo?) will delay into next week. Today started off a bit strangely. I was meant to fly in Warrior X-ray Sierra November (XSN), but having fuelled and checked the aircraft, the seat belt would not fit comfortably over my 6’4″ torso! The shoulder strap just didn’t extend far enough. So I made the call that I could not fly in this aircraft, and we transferred to the club’s newest reconditioned Warrior, India Juliet Delta (IJD), pictured below. Engine failure with ability to glide to aerodrome (practicing glide approaches). All interesting and challenging stuff. We had use of runway 29 centre for 10 minutes to demonstrate the first 2 procedures, then we transferred to the circuit runway 29 left for the other procedures. Did them OK and will do plenty more of them I am sure. Other than this, today was all about circuit consolidation. I started making my downwind radio calls, as an additional element of workload. My instructor is reasonably happy with all aspects of my circuits now, except the landing flare (which is probably the hardest part). This needs more work but I’m sure we can get it sorted out soon. Probably only 2 or 3 more circuit lessons before it’s time for first solo. So need to knock over the pre-solo exam as well. (Tomorrow’s weather may get in the way, so may use this time to prepare for exam and do some theory revision). Feeling pretty good about the circuits now. By no means perfect, but I’m definitely getting the idea now. Keen for more. One blemish. On late downwind my instructor sprung a simulated engine failure on me. I stupidly put my nose down to search for a suitable landing spot. WRONG! This was a situation for a glide approach back to the runway. Must get this right. You need to be prepared for simulated emergencies, just as you need to be prepared for the real thing. Instructors can and will spring them on you at any time!